During last year’s travel through Turkey, we were amazed at the history. We were fascinated by the various peoples who lived here over the millennia and fascinated by the Hittites, Lycians and Carians. This year, we decided to start our season in the geologically rich area of Cappadocia. To say it was otherworldly, magical and surreal seems almost like an understatement. 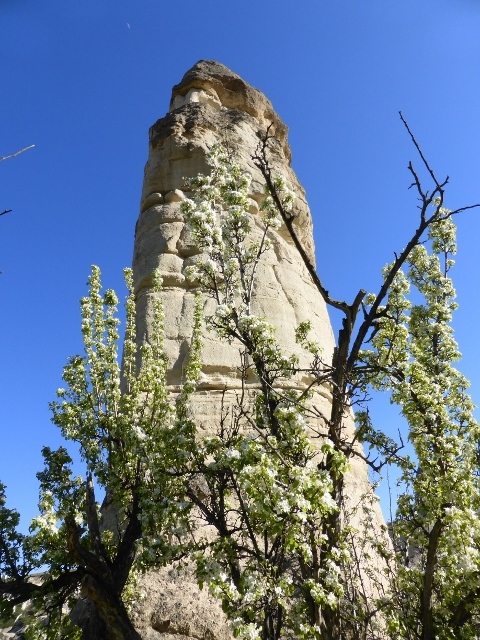 There were three volcanoes that threw tufa – a pumice-like stone, over the area of 160 square miles and later lava covered the tufa. Over the course of thousands of years the soft tufa eroded and left fairy chimneys, which were later transformed into rock hewn cave houses. 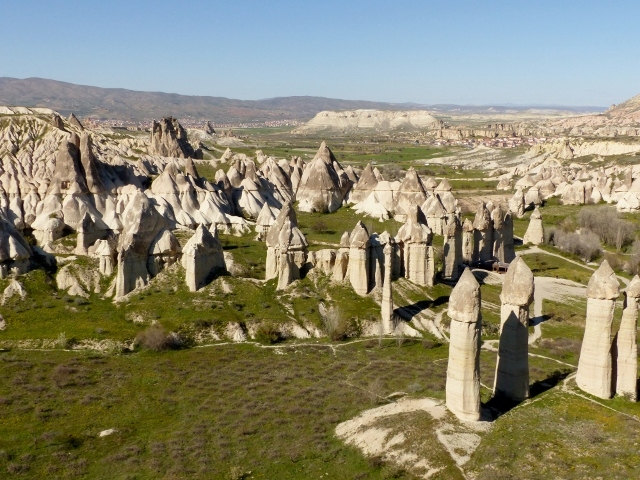 We had flown from a storm tossed Sydney to Cappadocia, with its cool April weather and blue skies. We stayed at Koza Cave Hotel in Goreme, on a hill overlooking Pigeon Valley. Our cave hotel was reminiscent of the dreamy movie, Winters Sleep. It was like walking onto a movie set: Turkish carpets on limestone floors and carved lintels and rustic artifacts. Koza Cave is family run hotel with personal attention to guests, recommendations and help with bookings. It was a lovely place to base ourselves, with views of Pigeon Valley from our room. 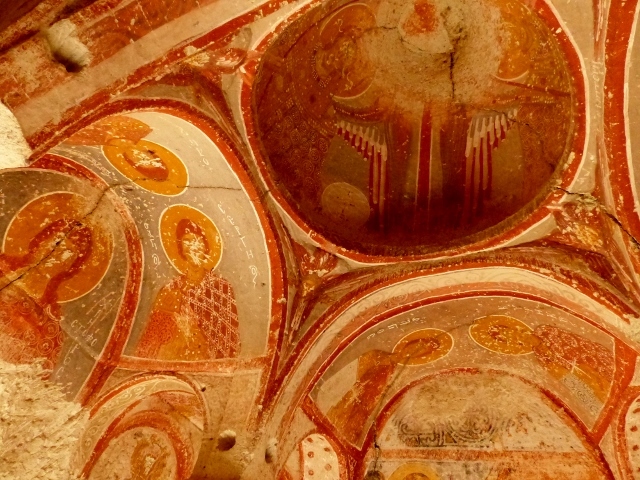 Between the 10th and 12th Centuries, monasteries and churches were carved into the tufa and a great example is at the Zelve Open Air Museum at Goreme. We viewed frescoes that have been partially restored and also saw the skeletons in their opened graves in the church floor. As busy as the Open Air Museum is, you feel it is sacred ground.Our tip would be to plan to be at the Open Air Museum at Noon, because the tour buses take their groups off for lunch and it is quickly quiet. We ran into Mustafa*, a taxi driver, with great local knowledge. For a reasonable price, he took us to view Love Valley, Pag Basa and an old church on the Goreme-Avanus Road, which has not been restored. Mustafa was able to drive us to these sights, so that the sun was always behind us for photos and he was able to tell us about the different sights we were seeing. There was one downside with our stay in Cappadocia. We were signed up for a balloon trip and at 5:00am found ourselves waiting to be ferried out to the balloon field, but the wind came up strongly and Butterfly Balloons weren’t able to take us up. 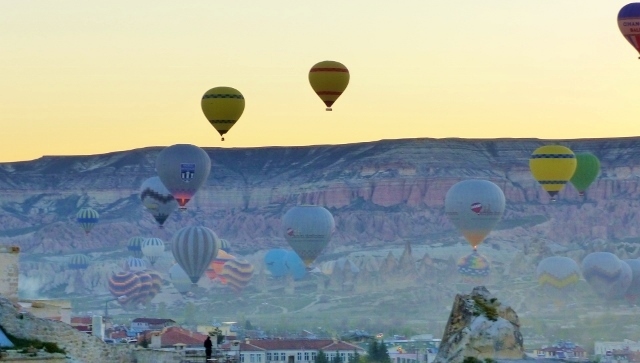 This means that Cappadocia has to go back onto the bucket list. Now we are off to Marmaris. *Mustafa C works for Goreme Muze Taxi.